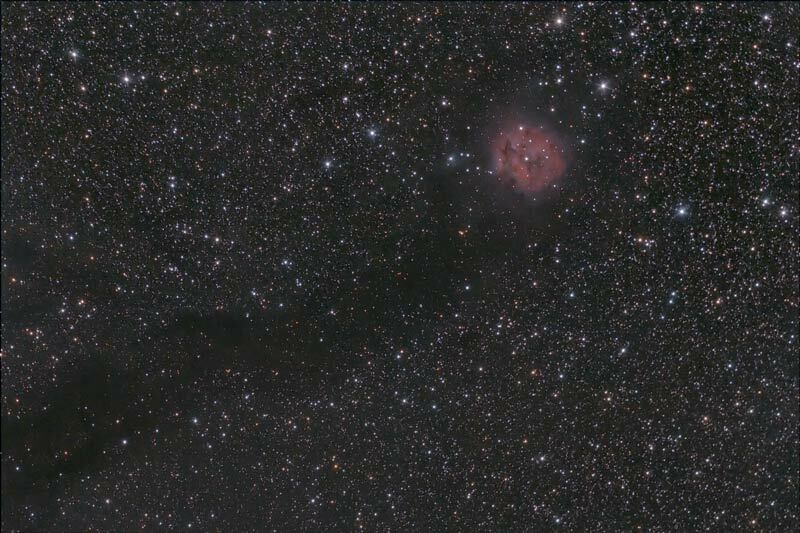 The Cocoon Nebula is a small round nebula centered near the apex of several dark lanes in the otherwise rich star fields of Cygnus. It floats within a sea of dark clouds and huge amount of stars. It is a star forming region, embedded in an open cluster of about 80 young stars, and contains emission, reflection and absorption nebulas. The large central star within the Cocoon has blown a hole in the nebula gas and is likely responsible for exciting the surrounding hydrogen to emit in Ha light. IC 5146, also Caldwell 19 and the Cocoon Nebula, is located near the naked-eye star Pi Cygni, the open cluster NGC7209 in Lacerta, and the bright open cluster M39. The cluster is about 4,000 ly away, and the central star that lights it formed about 100,000 years ago; the nebula is about 12 arcmins across. Esta imagen fue publicada en la sección "Astrofotografía" de la revista Astronomía No.117 de marzo 2009.